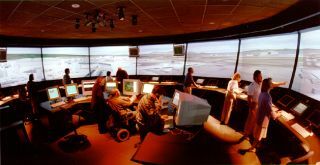 The first full-scale virtual airport control tower, called Future Flight Central, opened in December 1999. In this historical photo from the U.S. space agency NASA's "Future Flight Central," the world's first full-scale virtual airport control tower, is pictured. The facility opened December 13, 1999 at NASA Ames Research Center, Moffett Field, California. Constructed at a cost of $10 million, the two story facility was jointly funded by NASA and the Federal Aviation Administration (FAA). The facility is designed to test ways to solve potential air and ground traffic problems at commercial airports under realistic airport conditions and configurations. The "Future Flight Central" provides an opportunity for airlines and airports to mitigate passenger delays by fine tuning airport hub operations, gate management, ramp movement procedures, and various other airport improvements. Twelve rear projection screens provide a seamless 360 degree high- resolution view of the airport or other screens being depicted. The imaging system, powered by supercomputers, provides a realistic view of weather conditions, enviromental and seasonal effects and the movement of up to 200 active aircraft and ground vehicles.